The weatherman forecasts yet more triple digit temperatures all week for our part of Northeast Texas. So I’ll be cooking outside whenever possible to keep that cooking heat outside and not in my kitchen. I love my solar oven and I use it often, both in the summer and winter seasons. (for those of you asking, I have a Sun Oven brand solar oven and I LOVE IT!) I love BBQ pork sandwiches in the summertime. Today seems like the perfect day to indulge! As with all my cooking endeavors, I use a base recipe and just eyeball most of the ingredients. Substitutions are the norm for me. LOL. Today I pulled out two packets of ground pork from the wild hogs hunted and harvested by RancherMan earlier this year. I think these packages from the processor weigh about 1 lb each, give or take. I crumbled the meat into the black enameled covered pan that came with my *solar oven, then I poured in about 1/2 cup of strong coffee, added a few generous shakes of Worcestershire sauce and a splash of Claude’s Pork Marinade. I seasoned the meat with a sprinkle of chili powder and threw in a couple of whole cloves of garlic and some dehydrated onions from our garden. This wild hog meat is pretty lean and what little fat will get drained from it is pretty liquid even when chilled. There’s no thick unhealthy fat with this lean pork! So I’ll allow some of the juices to rehydrate the onions, adding a little extra flavor. Then I placed the covered pan in my solar oven around 2:30 in the afternoon and pointed the reflectors toward the sun. I adjusted the oven about every hour or so to track the sun & keep the temps around 350 degrees. I let the meat cook until around 5. Cook time in a solar oven depends upon how often you move the oven to track the sun, whether or not there is cloud cover partially obscuring the sun, etc. Mine was done in about 2 – 2.5 hours. I brought the pan inside, drained what little fat was present and took the garlic cloves & sent them through the garlic press and stirred them back into the cooked pork. Now I add some Homemade BBQ Sauce and bring out some soft hamburger buns. A healthy dollop on the bun and a few freshly-sliced onion rings and some zesty jalapeno slices from the garden and we’re good to go. I love solar cooking! * A word about our Affiliate Link – We are currently enrolled as an Affiliate. Occasionally I will insert an affiliate link into one of my posts if I think it may be of interest to you. I receive nothing from the manufacturer, but I love this solar oven & thought you might too. If you click on any of my affiliate links and buy something (almost anything, not just what was linked) I get a small referral percentage. But here’s the really important part – the price you pay for your items is UNCHANGED. This entry was posted in Blog Posts and tagged Cooking, Environment, Frugality, Gardening, Recipes, Solar Cooking on August 30, 2013 by Texas Homesteader. That’s a really neat solar cooker! Thanks for linking up at #SustainableSundays! I’ve never used one , it would be neat to see! I bought my husband a Dutch oven last year, haven’t used it much yet but the time we did the food was delicious. Thanks for sharing on Family Joy Blog Link-up. Please come back and join us again! Remember to leave your host a comment to increase the chance of being featured. How neat to see this in action! We melted some chocolate without an actual oven this summer. My daughter had fun with it! How fun! The kiddos would LOVE doing that! ‘Gotta try it! -Marci @ Stone Cottage Adventures Thank you for linking at Tuesdays with a Twist! 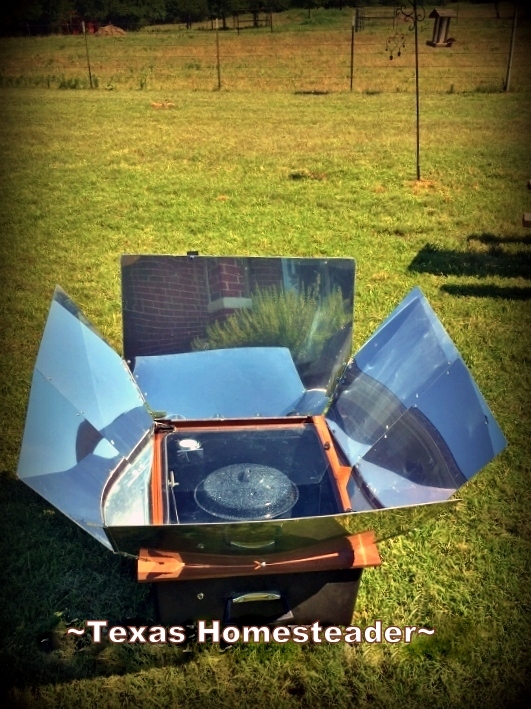 Solar cooking – what’s not to love? It keeps the kitchen cool and doesn’t cost money to use! Just make sure you bring it in every evening or the neighborhood dogs (or in my case bears) might sniff it out and want to investigate! Hahaha! I am so enthused by your solar oven. The BBQ recipe sound too good; coffee and pork…like my two favorite things. 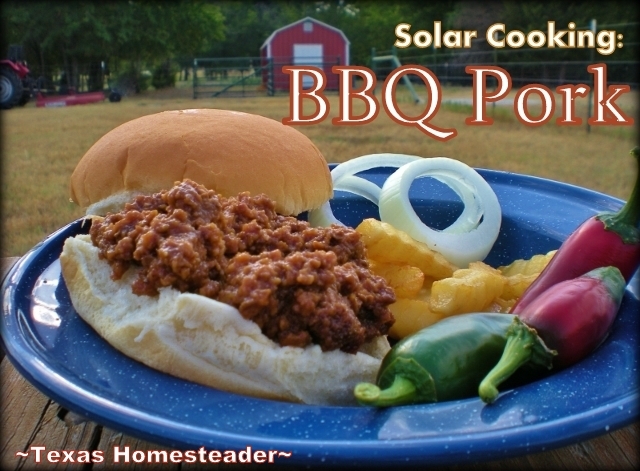 I love the idea of a solar oven but I didn’t know they would cook at such high temperatures. Now I’m gonna have to seriously look in to this! P.s. Your barbecue sandwiches look delicious!